Come say “Hey” to Harry, our Desert Hairy Scorpion! Desert Hairy Scorpions are the largest species in North America! 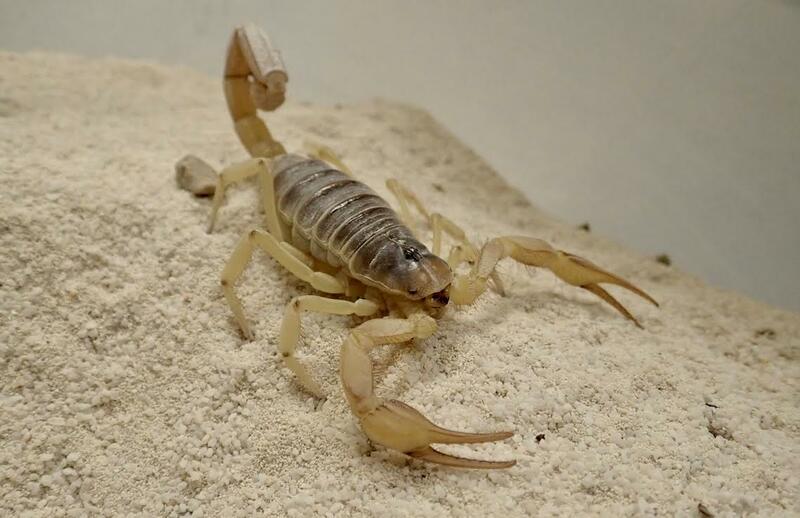 Like all scorpions, Harry is nocturnal and feeds at night. He’s often hanging out under his hide, but can be easily spotted with a UV flashlight, as he fluoresces! Habitat: Can be found in hot, dry, low-elevation valleys, where they may build burrows up to 8 feet in depth! Life Span: May reportedly live up to 20 years in captivity! Did you know? Scorpions give live birth! The babies will crawl onto their mothers’ back and live there for upwards of 10 days, until they’re ready to head out on their own.